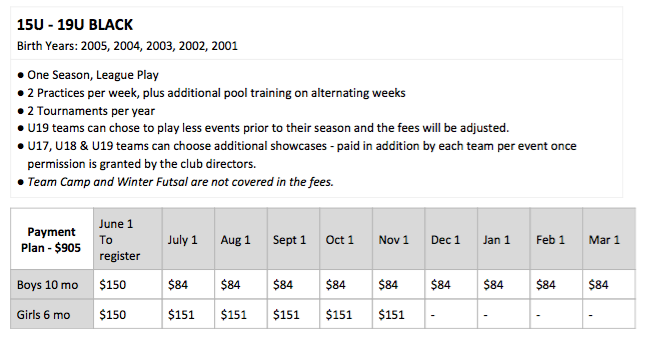 As of the 2018-2019 seasons we refined the structure for club player fees. 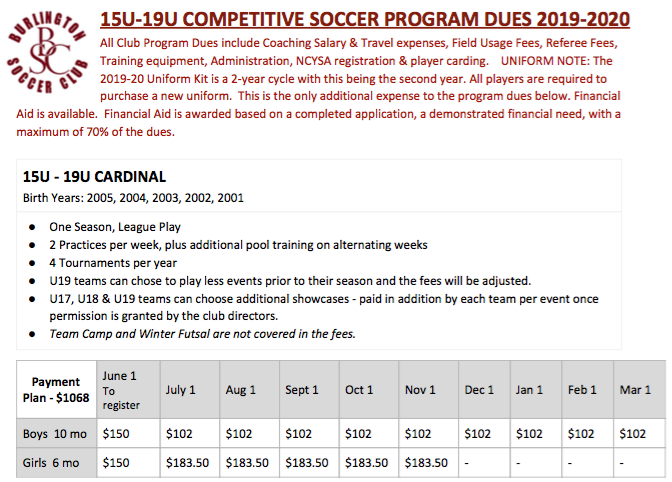 The primary expenses, including Club Dues and Team Fees, are being combined into a single "Club Program Dues" that will be paid directly to the club over a 10-month payment plan for all players except for High School girls teams (U15+) that play only in the fall season. Uniforms will still be paid separately to the supplier. Each year we have families that discover our Academy 6U-10U age group programming going in to the Spring season. There is a Spring Only fee structure. 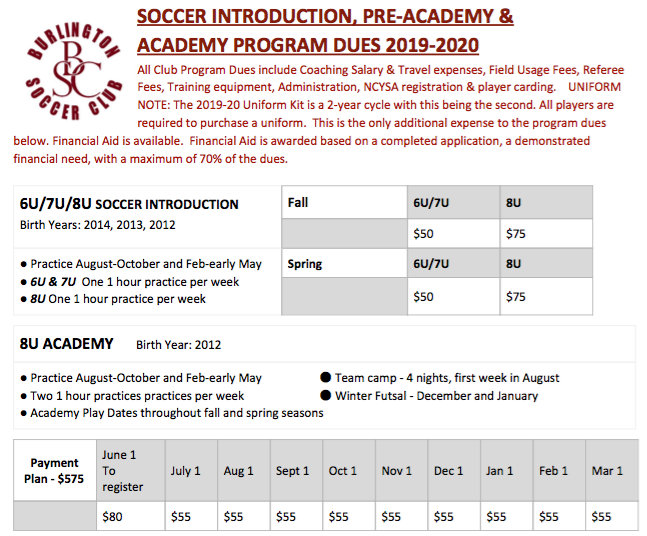 For inquiries on the Spring Only fees please contact the Director of Coaching or Associate Academy Director. Each year we also have families who discover our travel team programs or decide they would like to tryout for one of our travel teams at any one point in the year. We offer open tryouts to those players at any point in the year. 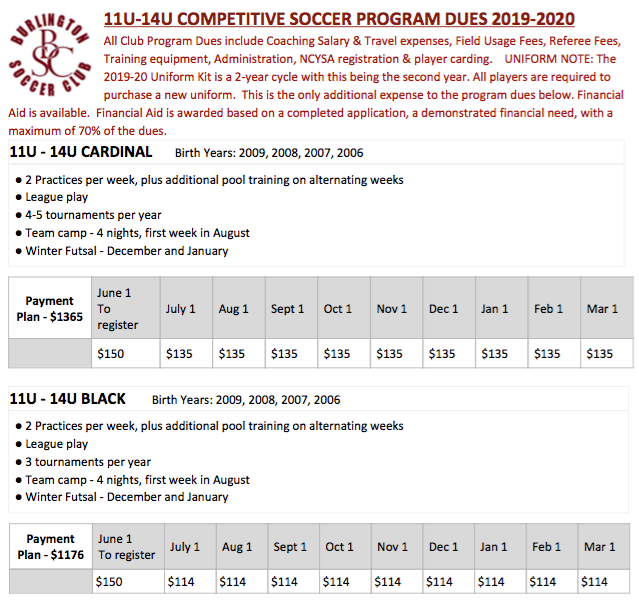 We also consider prorating the fees pending the time of year any one player joins the club. If you are interested in being evaluate for any age group in the club please contact the Director of Coaching. Q: Are there any other out of pocket expenses? A: The only other expense is uniforms every 2 years. This is the second year of a 2 year uniform cycle. Q: What if my team wants to play in more tournaments than allowed for? A: If an additional tournament is requested by the Coach, the club directors will review the request. If permission is granted than the amount each family has to pay for that particular event will come from the families, paid to the team, and the team will pay that tournament fee. Q: What are plans to make up practice days missed due to rain? 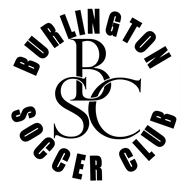 A: Through our partnership with Burlington Parks Recreation Department, teams may schedule make up practices Friday, Saturday or Sunday. Direct feedback from our membership community: This restructuring is the result of a three-month review process that involved a cross-functional group of 25 representatives of our club. We would like to thank all the leadership staff members, coaches, team managers, and Board members who attended meetings about this change and provided data and feedback during the process. Reduce uncertainty in costs: The old split-cost model of separating Club Dues and Team Fees created confusion and uncertainty for members about total costs and timing of payments. This new model simplifies and clarifies the total costs and standardizes all payments throughout the year. Remove burden on Team Managers: The old Team Fees approach placed a large burden on volunteer Team Managers who were responsible for calculating team budgets, collecting team fees, and using their personal bank accounts to manage the team's expenses. Starting in 2018-2019, club staff will oversee all team budgets. Improve and standardize the club environment: Club Director Jeff Gross and Director of Coaching JP Strachan have worked to implement a new level of expectations for our coaches and players that aims to create an improved club environment that is both more enjoyable and more competitive for our players and teams. This includes standardizing how Team Fee-related expenses are used and creating new and enhanced opportunities for the players to develop their skills.